Covent Garden, London is a great destination for people who want to get a taste of everything that London has to offer. It is full of boutique shops, markets, theatres, bars, historic spots, and cultural sights. Whether you’re looking to live like a local or explore some of the main tourist attractions, there is plenty to see and do. 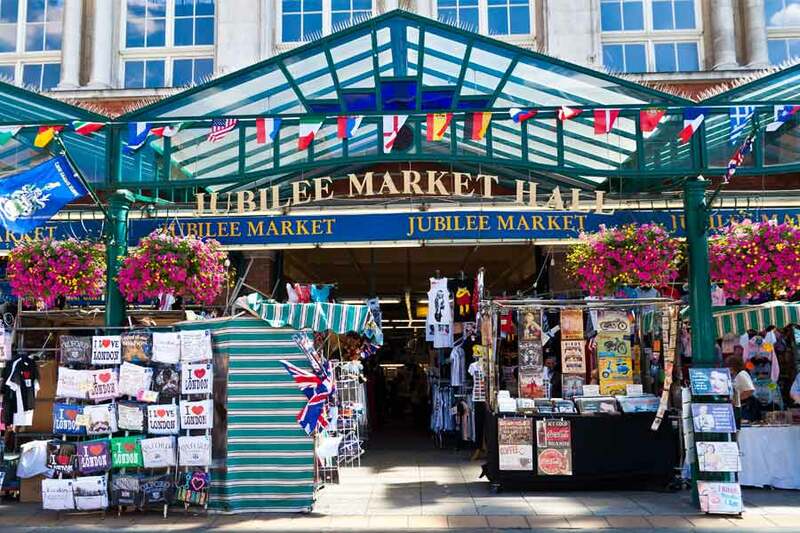 The Covent Garden Market is a great place for both locals and tourists. There is a mixture of stalls to enjoy, with everything from food to brick-a-brack, souvenirs, jewellery, clothing, artisanal goods, and more. You can pick up some great bargains at the market and it’s a nice break from some of the more mundane chain stores. Let’s face it, some parts of London have taken on an “any Western City” feel, with the same stores there as you would find in Paris, Berlin or Los Angeles. Did you know that the pattern on the seats of the busses and the London Underground carriages is called “moquette”? Do you know the history of the red buses? Do you know about the now ‘hidden’ abandoned Underground stations? You can learn about all that and more when you visit the London Transport Museum. If you want to take in a bit of culture, then the Royal Opera House is world famous and hosts some incredible performances. In addition, during the day it is possible for visitors to take a tour of the Opera House, even if they are not visiting for a show. If you’re looking for a unique shopping experience, head to Neal’s Yard. It’s a brilliant place to go get some photographs, and to visit the boutique stores in the courtyard. Pick up some British cheeses, or enjoy a chocolate tart. There’s something for everyone. It’s hard to get a much more traditional or gentlemanly treat than Mr Fogg’s Gin Parlour. This luxurious salon is located above Mr Fogg’s Tavern, and it is situated in what used to be the home of Gertrude Fogg, the aunt of Phileas Fogg. Choose from a selection of more than 300 different, rare gins and enjoy the atmosphere of the Victorian-inspired parlour. If you’re planning to visit Covent Garden then you have a lot of options for places to stay. There is a wealth of accommodation options within Covent Garden, and you will also find no shortage of accommodation in other parts of the city. One of the best things about London is that between the Underground and the bus network (which includes night buses), it is very easy to get around. So, if you don’t want to pay for a hotel in a central location you can stay on the outskirts and travel into the city quite easily. It is often better to rely on the public transport network than to hire a car since the city’s congestion charge makes using a car quite expensive. The Strand Palace Hotel is one of the most popular hotels in Covent Garden itself. It is located just a few hundred metres away from some of the most popular theatres in Covent Garden, and it has been open to guests since 1909, making it a piece of modern history. If you’re looking for something more contemporary, then the Z Hotel is a great choice. The central location, close to Drury Lane, makes this a popular choice with theatergoers, and the shared lounge means that it is easy to meet your fellow travelers. Another option is to rent a short stay apartment. Many tourists opt to do this because it is an affordable option for a family and it also means that you get more privacy, and even have the ability to cook your own meals. For those who are traveling with children this can be an important benefit. You also get to relax without having to worry about your sleep being disturbed by other guests (or you disturbing other guests by coming home late). Covent Garden is only a 5-minute drive from the Espresso Translations offices. Covent Garden has something for everyone. It is a great location for those who love the theatre, and it is also quite a trendy location with a thriving bar scene too, which makes it suitable for younger holidaymakers. It is not far from the city center so you can still visit Big Ben, Buckingham Palace, the Science Museum, the Sherlock Holmes museum, the Diana Memorial Playground in Kensington Gardens and all of the other popular attractions within central London. Prices can be expensive compared to other parts of the United Kingdom, but if you visit during a time when the pound is weak then you should find that you can do quite a lot with your money, and enjoy a nice and varied vacation. Find out more about other London tourist attractions, such as the British Museum.